The Köppen-Geoger climatic zones are useful for pest risk assessments as a means of undertaking a first-pass assessment of risk based on whether a species is found in the same climate zone as the pest risk assessment area. They may also have a role in assisting modellers to set the model background when using techniques such as MAXENT (e.g. Thompson et al. 2011, Webber et al. 2011). The Köppen-Geiger climate system was derived through consideration of the climate and the broad patterns of vegetation cover. 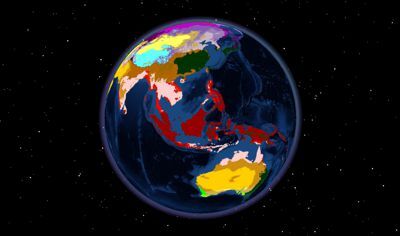 In the original mapping, the boundaries of the climate classes were drawn where there was a significant perceived change in the vegetation type. Thus, of the myriad different means by which the many climate variables could be clustered, this system ensured that there was some ecological meaning to the climatic classes. The Köppen-Geiger data products presented here should be preferred to those of Peel et al. (2007) because the underlying climate data has been splined using appropriate covariates, and then the classification algorithm was applied to each cell. In contrast, Peel et al. (2007) applied the classification system to raw station data, and then applied an inverse distance weighted interpolation system to the classified data. On the surface, this may sound like a petty difference. However, the method of Peel et al. (2007) ignores the effects of topography in between the meteorological stations, whereas our method takes them into account at the spatial resolution of the resulting dataset. In short, the geographical boundaries of the classes in the products presented here should be more reliable than those of Peel et al. (2007). The classification algorithm adopted here for calculating the Köppen–Geiger climate classification generally follows that of Peel et al. (2007), who followed Köppen’s last publication on his classification system in the Köppen–Geiger Handbook (Köppen 1936). There were three points of departure from these algorithms: (i) we followed Russell (1931) and used the temperature of the coldest month >0 °C, rather than >3 °C as used by Köppen (1936) to define the boundary between the temperate (C) and cold (D) climates; (ii) we followed Peel et al. (2007) in using a 70% precipitation criteria for distinguishing the B climates; and (iii) we followed the approach of Peel et al. (2007) in making the subclasses ‘s’, ‘w’ and ‘f’ mutually exclusive. Köppen-Geiger data layers, based on the both the CliMond climate data at 10' and 30', and the Worldclim data at 5', are available in ESRI grid or shape file format. In collaboration with Borntraeger Science Publishers, we are delighted to be able to make available a PDF of the original manuscript in which Wladimir Köppen (Graz, Austria) and Rudolf Geiger (Munich, Germany) published their climate classification scheme. Entitled "The Geographic System of Climates", the PDF is Volume 1 Part C in the Handbuch der Klimatologie, a 5 volume series published between 1930 and 1938. In this work published in 1936, Köppen devises the climate classification that is later to be known as the Köppen-Geiger system of climate classification. The full citation is as follows: Köppen, W. (1936) Das geographische System der Klimate. Handbuch der Klimatologie (ed. by W. Köppen and R. Geiger), Vol 1 Part C pp. 1-44. Verlag von Gebrüder Borntraeger, Berlin.